Roller skating is a fun, safe way for the whole family to enjoy getting some exercise. But what if you don’t know how to skate? Don’t panic, it’s not as hard as it looks! 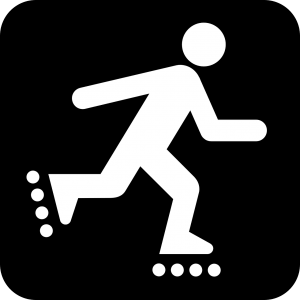 Rainbow Skateland in Lockport, NY welcomes skaters of all ability levels, including people who have never worn a roller skate before. Here are some tips to get you started. Relax! The first step is to take a few deep breaths and shake out your shoulders. Roller skating in a rink is safer than outside, because our skate floor is carefully maintained to keep it smooth and level. Remember, our friendly, knowledgeable staff are here to help you have a great time. If you have questions, ask! Safety First. Make sure you get the right size skates, and that they are laced properly. Ask for help from a staff member if you’re not sure. Wear comfortable clothing that doesn’t drag the floor. While a helmet, knee pads, and elbow guards are not required at Rainbow Skateland, you should wear safety gear if it makes you feel more comfortable. Assume the Position. Once you’re laced into your skates, stand with feet about shoulder-width apart, bend your knees, and squat. Act like you’re sitting in a chair. Lean Forward. Your instinct will be to lean back to keep from falling, but this is the opposite of what you want to do. Leaning forward will give you more control and better balance. And finally, don’t forget to practice. As with any activity, the more you roller skate the better you’ll get! Check out our special events or come visit Rainbow Skateland any time we’re open for open skating.